Add bass and depth to your second-gen Echo system. The Sub will appeal to those who have never considered spending big money on an music system, while enjoying the convenience and connectivity of Alexa. There are some foibles, but it's a great modular upgrade. The biggest criticism of the Amazon Echo is that it doesn't sound that good. It's a criticism that needs qualifying, because we've never really thought of the Amazon Echo as a speaker for music. Rather, it's all about its Alexa voice assistant. With Google now offering a wider range of speakers – there's Home and Home Max as its two majors – and Apple having its own crack with HomePod, Amazon has made what's perhaps a surprise move with the Echo Sub: a companion to the Echo that's solely there to boost bass and therefore overall sound quality. Is the Sub a huge acknowledgement of Echo's quality criticisms, or a rebellious kickback against the audiophile empire? Why would you need an Echo Sub? When Apple launched the HomePod it went for the audio jugular. Arguably, Apple did a great job in launching a great sounding speaker, but it missed the smart part of the equation. The HomePod pales in comparison when it comes to functionality, unable to match the offering from Alexa or the diversity of the supported smart home ecosystem working with Alexa. To us that has always made the Echo a winner as a functional smart speaker, accepting that it was never designed as a primary audio device. The launch of the Echo Sub potentially changes that arrangement – along with the option for stereo pairing of Echo devices – to appeal to those who want a better music offering alongside Alexa convenience. That's really what the Echo Sub is for: it isn't a standalone device, you need to have an Echo (second-gen) or an Echo Plus (second-gen) for this £119 bass-box to work. You can also use it with an Echo Dot (fourth-gen) (but seriously, if you're pairing an Echo Dot with the Echo Sub you need to have a long hard think about what you're trying to achieve). 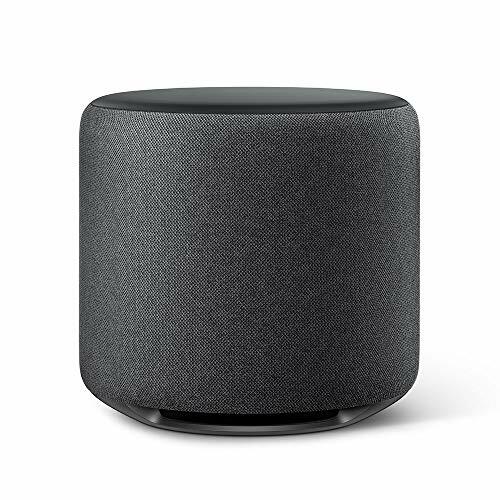 And if you don't have an Echo yet, you'll perhaps be interested in knowing that Echo Sub with a pair of Echo speakers is being sold in a package – and that still comes in far cheaper than just one Apple HomePod. Setting up the Echo Sub is actually very easy. All you have to do is plug in the power cord and everything else happens within in the Alexa app – the same as any other Echo device. The Echo Sub needs to be paired with another compatible Echo device (as listed above), to become 'Sub Pair', otherwise it won't do anything – and it doesn't have a mic or visible lights to tell you what it's doing. Its only function is to sit and provide the bassline from the 6-inch downfiring woofer built into its compact body. Well, we say 'compact' but that's a relative term – it's compact for a subwoofer. Like all subwoofers, Sub is designed to be added to a room and its placement is best towards the centre of the soundstage, rather than hidden behind a sofa off to the side – especially if you're using it connected to a stereo pair of Echo speakers. The woofer provides 100W output and outputs down to 30Hz. Its not a huge output, but context needs to be applied: this isn't the £699 Sonos Sub and it isn't a home cinema sub; rather it's an affordable boost for your Echo speakers. Besides, it's likely more powerful than most woofers in other all-in-one systems. Bass adds richness to audio and you'll notice that as soon as you have the Echo Sub paired with your Echo speaker. We tested it with the Amazon Echo Plus (second-generation) and found that it provided a warm and meaty quality to music. Fire up tracks with pronounced low-end and you'll really feel and hear the difference that it makes. While it's a party-level boost to pop music, skip over to some more diverse genres and you'll find the Echo Sub pairing do music proud. Sure, audiophiles will probably still be calling 'more, bigger, better' – but this little box isn't aimed at people who would spend £2000 on an amp or cables. You can adjust the volume of the sub to your preference, so if you want more oomph, you can turn that low-end up to dominate. If you want a lighter touch, you can turn it down. This is all controlled within the Alexa app, where the Echo Sub will appear alongside any other Alexa devices you own. However, it's important to note that the equaliser for Sub is the same as the dominant Echo in the pairing – so when you're making those changes, it applies to the paired speakers, rather than just the Sub. So, does the performance of the Echo Sub warrant its existence? Very much so. If you want to turn your Echo into a primary music system then Sub will give it substance. Yes, there are lots of other things you could buy, like a hi-fi system or larger speakers that you then add an Echo Dot or Echo Input to, but in terms of sheer simplicity and affordability, the Echo Sub is a winner. We've found that the Echo Sub has been stable within that pairing with the new Echo Plus. We've had no syncing problems: you ask it to play and off you go, foot tapping along with John Coltrane. That applies in a connection to a single device or in a stereo pair. In a 2.1 setup, the system sings, and really is very good. But there are some interesting points that you might pick up on when you come to use the speaker yourself. In isolation, they might not mean much, but as Amazon asks you to invest more in the Echo system, it's these small cracks that start to show. One of these is that some skills don't appear to fire the bass. We listened to BBC Radio 1 on TuneIn and it's perfect, lots of poppy bass; ask Alexa to play BBC Radio 1 via the BBC skill, however, and you get no Sub engagement at all. We've asked Amazon why this might be - but the best approach is to specify TuneIn when you ask for music. There's also a slight oddity with background bass. When you talk to Alexa, the volume of the music on the main speaker (Echo Plus in this case) drops, while the Sub keeps rumbling on. If you're asking Alexa to be quiet or change songs, then you get a few more bars of the bass from the song you were listening to before the action is completed. Sometimes the original song reappears in a blast before the next song is then started. It's not a perfectly slick experience (although this seems more to do with the Echo than the Sub itself). Finally, there's the app. As the Alexa ecosystem expands, the importance of good software becomes more important. A recent redesign has made it a lot more user-friendly, but it's still pretty slow to navigate. There's 'thinking time' as you move to your Alexa devices which slows everything down – and there are times when you're trying to create a multi-room pair and a device just won't play along, but 20 minutes later it might all work fine. These aren't critical failings of the Sub, but just be aware that smart speakers are a new and rapidly evolving entity, and that there's a lot of software involved. If you're an Echo fan wanting to push aside other systems and use the Echo as your sole music system, then the Sub is a great way to do so. When it comes to room-filling party performance, the Sub paired with the new Echo Plus will give you that experience. On the flip side of that coin is how you actually use your Echo. If it's a replacement for a kitchen radio – used for timers, information and talk radio – then there's a good chance that you'll be perfectly happy with things as they are. The Echo gives you respectable performance for day-to-day tasks without pumping bass. The great thing about Amazon's modular approach here is that you can have that light touch, or swing in and pick up a subwoofer to boost the music experience – and that's flexiblity that no other system offers at this price. It's easy to recommend the Echo Sub. It's likely to appeal to those who have never considered spending big money on an music system, while enjoying the convenience and connectivity of Amazon's Echo system and Alexa voice control. It's all about that bass.